FACT: A frugal plant. It takes 10 years from seed germination until it blossoms. 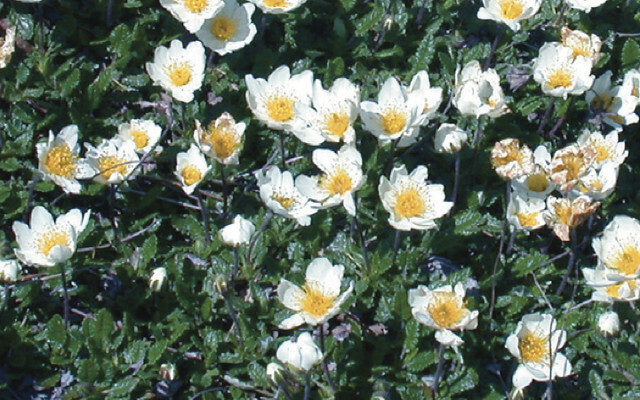 Dryas octopetala (common names include mountain avens, eightpetal mountain-avens, white dryas, and white dryad) is an Arctic–alpine flowering plant in the familyRosaceae. It is a small prostrate evergreen subshrub forming large colonies. The specific epithet octopetala derives from the Greek octo (eight) and petalon (petal), referring to the eight petals of the flower, an unusual number in the Rosaceae, where five is the normal number. However, flowers with up to 16 petals also occur naturally. Dryas octopetala has a widespread occurrence throughout mountainous areas where it is generally restricted to limestone outcrops. These include the entire Arctic, as well as the mountains of Scandinavia, Iceland, the Alps, Carpathian Mountains, Balkans, Caucasus and in isolated locations elsewhere. In Great Britain it occurs in the Pennines (northern England), at two locations in Snowdonia (north Wales), and more widely in the Scottish Highlands; in Ireland it occurs on The Burren and a few other sites. In North America it is found in Alaska, most frequently on previously glaciated terrain, and through the Canadian rockies  reaching as far south as Colorado in the Rocky Mountains. As a floral emblem, it is the official territorial flower of the Northwest Territories and the national flower of Iceland.